Tibetan New year, also known as Losar, is the most important festival in the Tibetan calendar. It is mainly celebrated over a period of 3 days in late January or February. In 2019, Tibetan New Year falls on Tuesday, February 5, while in 2020, it is set for February 24. 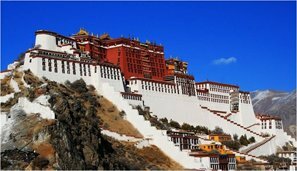 However, during Tibetan New Year period, Tibet is not open to foreign travelers. But you can read on to learn about this colorful festival. The Tibetan calendar consists of 12 (or 13) lunar months, and Losar begins on the first day of the Tibetan year. The Tibetan calendar is lunisolar and almost identical to the Chinese calendar. Tibetan New Year is the same as Chinese New Year, a day earlier, or a day later. The adding of a 30-day month is occasionally done differently (e.g. in 1966), making Tibetan New Year a month later than Chinese New Year. Losar is celebrated by Tibetan people. It is marked with ancient ceremonies that represents the struggle between good and evil. There is chanting and passing of fire torches through the crowds. A certain amount of levity is provided by events such as the dance of the deer and the amusing battles between the King and his various ministers. 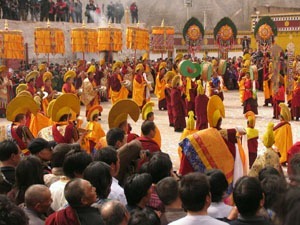 Losar Festival is characterized especially by dancing, music, and a general spirit of merrymaking. During the last two days of the old year, which is called Gutor, people in Tibet begin to prepare for the New Year. The first day of Gutor is spent doing the house cleaning. The kitchen especially must be cleaned because it is where the family&apos;s food is prepared, and hence is the most important part of the house. The chimney is also swept free of dirt. Special dishes are cooked. One such dish is a soup served with small dumplings. The soup is made from meat, wheat, rice, sweet potatoes, cheese, peas, green peppers, vermicelli and radishes. The fillings for dumplings include scraps of wood, paper, or pebbles. The celebration of Losar begins on the 29th day of the 12th month of the Tibetan calendar, the day before Tibetan New Year&apos;s Eve. 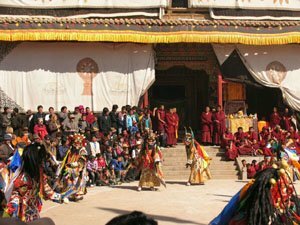 On that day monasteries hold a special kind of ritual in preparation for the Losar celebrations. In addition a kind of special noodle called guthuk, which is made of nine different ingredients including dried cheese and various grains, is made. Dough balls: Also, people place various ingredients, such as chilies, salt, wool, rice, and coal, in dough balls, which are then handed out. The ingredients that one finds hidden in one&apos;s dough ball are supposed to be a lighthearted comment on one&apos;s character. For example, if a person finds chilie in his dough, that means he is talkative. If white-colored ingredients such as salt or rice are hided in the dough, it is believed as a good sign. If someone finds coal in his dough, it has the same meaning as finding coal in a Christmas stocking; it means that one has a "black heart". On the second day of Gutor, religious ceremonies are held. People go to visit the local monastery to worship and give gifts to the monks. Tibetans also set off firecrackers to get rid of evil spirits, which are believed to be lurking around. The last day of a year is a time to clean and prepare for the approaching New Year. 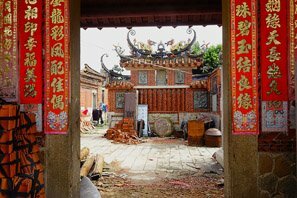 Houses are thoroughly cleared, after which people get dressed, and proceed to have a reunion feast, which is similar in spirit to the Han Chinese New Year feast. On Tibetan New Year&apos;s Day, Tibetans get up early, and put on new clothes after having taken a bath. They then worship the gods by placing offerings in the front of their household shrines. The offerings usually consist of animals and demons made from a kind of dough called torma. In addition this day is for family members to exchange gifts. Families also have a reunion dinner, which usually consists of a kind of cake called kapse and an alcoholic drink called chang, which is drunk to keep warm. Traditionally, on the first day of the New Year, the housewife will get up very early. After cooking a pot of barley wine for the family, she will sit beside the window awaiting the sunrise. As the first ray of sunshine of the New Year touches the nearby earth, the housewife takes a bucket and heads for a nearby river, or well, to fetch the year&apos;s first bucket of water, which is seen as the most sacred, clearest water of the coming year. The family that fetches the first bucket of water from the river/well is believed to be blessed with good luck for the coming year. At Ta&apos;er Monastery, on the first day, Lamas will hold religious celebrations, which include worshiping Buddhist deities, chanting Buddhist scriptures, and having a new year banquet. On the second day, people visit friends and relatives. At night Tibetans whirl burning torches in the homes to drive away evil spirits. On the third day, Tibetans in Lhasa especially visit the local monasteries, where they make offerings. The word losar is a Tibetan word which means New Year. The word is composed of two characters: lo and sar. Lo means &apos;year&apos; and sar means &apos;new&apos;. The celebration of Losar can be traced back to the Tibetan pre-Buddhist period (127 BC – 629 AD). At that time Tibetans were followers of the Bon religion, and held a spiritual ceremony every winter. During the ceremonies, people burnt a large quantity of incense to appease local spirits, deities, and protectors. Later this religious festival developed into an annual Buddhist festival. Tibetan New Year, also known as Peasants Day for Tibetans, is the most ceremonious festival in Shigatse, and it falls on the 1st of the twelfth month according to the Tibetan calendar. Shigatse is a rich and fertile agricultural area, where the local people created their own calendar 100 years ago to better arrange agronomic activities. It is a tradition for people living in Shigatse and Lhasa to keep their yards and kitchens clean and tidy during Tibetan New Year, when the locals put up New Year paintings on the doors to add luster to the festival. The most unforgettable experience of Tibetan New Year in Shigatse Area is eating gutu, a kind of dough with white stones, capsicums, wool, or charcoal in it, which has a rich symbolic meaning. If a man eats a gutu with wool in it, he is considered to be kind-hearted; if he eats one with a capsicum in it, he is thought to be harsh-tempered; if he eats one with a charcoal in it, he is deemed to be vicious; and if he eats a dough with white stones, he is regarded as unpopular among the crowd, so he will be forced to drink wine as a punishment. The dishes served during Tibetan New Year are traditionally dominated by mutton, including dried mutton, boiled mutton, and roast mutton. Great changes have taken place in Shigatse&apos;s food habits, and the dishes are richer than ever before. A number of cultural entertainment performances take place in Shigatze during Tibetan New Year, including horse-racing, arrow-shooting, singing, and dancing. As the first festival throughout the year, Tibetan New Year is the most ceremonial festival in Kongbo Area of Shigatze Prefecture, central south Tibet, in the Yarlung Tsangpo River Valley. It is a festival for families to get together, and it’s celebrated just as the Han ethnic people celebrate their Spring Festival. The legend goes that Kongbo Area faced war during the early period of 13th century. When Kongbo tribe leaders called on all their people to prepare for the war, they didn’t know when they could return home owing to the long distance from their hometown to the battlefield. So they decided to celebrate the New Year on 1st of the tenth Tibetan month in advance before they went for battle. The Kongbo Tribe won the victory over their enemies eventually owing to their great tenacity, since when it’s become a tradition for them to celebrate the New Year on the 1st of the tenth month according to Tibet calendar. 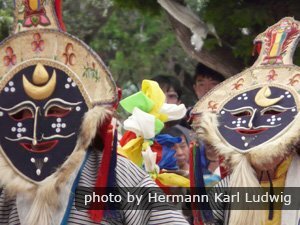 There is a unique custom in the Kongbo New Year celebrations. On the evening of the last day of the year, each Kongbo family will put foods prepared for the New Year into a wood plate, then put the wood plate in the middle of the yard and let the dog eat those foods. It is believed among the Kongbo people that the food the dog eats will predict something in the following year. For example, if the dog eats the cuo (a kind of food made of roasted barley flour), people believe there will be a good harvest in the following year. If the dog eats cheese or butter, people think that livestock breeding will be good. If the dog eats dried peach, people think that all the family will have a lucky year. Not interested in the above tours? See more ChinaHighlights Tibet Tour to experience the local pageantry of Tibet. 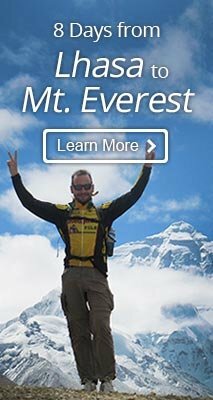 You can also contact us to create a Tibet tour for you.